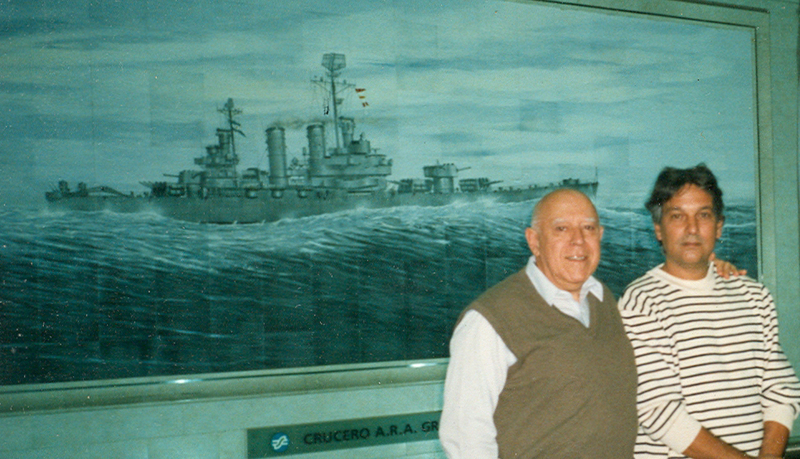 Narenda Sethia (right) with his friend Belgrano's 3rd-in-Command, Captain Nestor Cenci 'Coco,' in 2001. We are now over 9,000 miles since sailing. A day of fast passage to our new areas around the Falkland Islands and Tierra del Fuego. The weather is relatively calm up top—for the first time since we got here! Communications are a hell of a problem and this morning we got out traffic via New Zealand which is closer than the UK. We seem to be surviving, though defect and after defect is arising and the boat is clearly screaming out for a refit. It is amazingly cold on board and we are all wandering around in heavy pullovers. Continuing passage to an area where the threats are from the cruiser Belgrano—an ancient ex US World War ship with no sonar or ASW (anti submarine warfare) capability, two equally decrepit destroyers and an oiler. However, we still don’t know where the two 209-type diesel boats (modern German-built submarines) are. Arrived in an area in the afternoon–we are about 200 miles south-west of the Falklands and about 120 miles east of Tierra del Fuego. The weather today has been incredibly good—very calm clear skies, sunny and excellent visibility; perhaps the calm before the storm! In the evening we received a signal stating that HM Government has decided to ‘use more military force’ and has authorised the ‘destruction’ of the (aircraft carrier) Veinticinco de Mayo—it would be great if she went down on 25th May! In fact she is in Splendid’s area. We are managing to get signal traffic in. Still no sign of the enemy, though we picked up some faint signatures in the afternoon. A periscope depth from 1600 onwards. The signatures we held earlier turned out to be the Argentinian surface group, and we closed to within 4,000 yards of them in the forenoon. There is one cruiser, the Belgrano, two destroyers and an oiler—we caught them in the middle of an RAS (replenishment at sea), which would have made a superb target, but unfortunately they were south of the exclusion zone. Spent most of the say trailing them discreetly from about 10,000 yards as they headed west, hoping that our intelligence reports are accurate and that they are going to turn north into the zone. No news of the carrier yet, so one presumes it is still floating. Excitement before going to bed tonight, as we believe we will be going to action overnight to loose a couple of Mk24s (torpedoes)! Well, they’re not so stupid—they spent the night meticulously paralleling the exclusion zone, about 18 miles to the south of it. Frustrating! They’re doing about 13 knots, and only the occasional radar sweep. We hope they’re not heading for South Georgia! No external news updates for 24 hours now, though we are still surviving with all out (communications) problems. On the home front, my diet seems to be working at last. This afternoon I knew what fear was. At 1400 we received a sign; authorising us to sink the cruiser Belgrano, even though it was outside our exclusion zone. We had been trailing her for more than 25 hours and held her visually at PA (periscope observation). After tracking her for awhile, we went to action stations around 12500 and shut off for attack. The tension in the control room was mounting steadily. We went deep and opened (moved away) from the cruiser’s port side to about 4,000 yards. She was flanked by two destroyers. At about 1600 we fired three Mk8 torpedoes at the Belgrano. The atmosphere was electric as the seconds ticked away: 43 seconds after discharge, we heard the first explosion, followed by two more—three hits from three weapons. The control room was in an uproar, 30 people shouting and cheering. The captain, at the attack periscope, was screaming out orders—10 down, starboard 30, half ahead, 130 revs. Everyone was hysterical, stamping and cheering, and it became quiet only after two or three minutes. We went deep then, after about five minutes, there was a loud bang—a depth charge. Everyone froze, but the skipper ordered shut off for counter attack and we took evasive measures, hurtling down to (deleted) feet. There was silence throughout the boat—suddenly it was no longer fun to be doing what we were. We were on the receiving end. For an hour we hurtled along at full speed. Palms were sweating. You could hear a pin drop. The tension was almost unbearable. We then slowed down for coming to PO (periscope observation) 18 miles from where we attacked. After five minutes another long bang, possibly a depth charge. We had just begun to relax, thinking we were clear, and this brought us back to our sense. Again, evasive manoeuvres and complete silence throughout the boat. I think we were all very frightened—the destroyers were not transmitting on sonar, so how had they found us, 18 miles from the datum (scene of action)? Did they have a Neptune aircraft, dropping Jezebel (listening) buoys? Suddenly it seems that we were hunter. I felt scared, almost trembling, sweating and nauseated. I thought of what we had done.—of the men we had killed. Although we may not have sunk the cruiser, the captain said he had seen flashes of orange flames as the weapons hit. . .
Scared but determined, we kept going, praying that their destroyers weren’t still on to us. We went on for another hour and finally slowed down some 26 miles from the datum. To our relief we had no further contacts and were then able to return to periscope depth to transmit (a report of) what we had done. As I write, I am still overwhelmed by it all. I can hardly believe the enormity of what we have done. We can’t go back and apologise now—it’s too late. I wonder how many died. I wonder, even more, what the reaction will be? The lads have taken it very well—a couple were frightened outwardly, and the rest of us made do with being frightened inwardly. It was all over by 1915 local—I came out of the bandstand (control room) after 61/2 hours of concentration, mentally and physically drained. We had a glass of wine in the wardroom and spent the evening discussing what had happened. I don’t think that most of them really realise it yet—they are still as I am, a bit ‘high.’ However, everyone is smiling nervously, expanding on the rights and wrongs, recalling the tension and the feelings. I went to bed at 2130, my heart pounding against my chest. Every little noise made me start—my ears have become sensitive to the slightest bang and we are all of us finding that we jump when there is a bang. Our task now is still and anti-shipping patrol, and by 2100 we are heading back to the west at 12 knots. Twice the destroyers were heard searching and dropping the occasional charge. Perhaps they are looking for survivors? It was, all in all, a very long day. I think now most of us want to go home. We never really thought, on the way down, that we were actually going to do this. Now I think we are all stunned—the little things in life now seem relatively unimportant as the prospect of death becomes so real; the only consolation, I suppose, is that the end would be cold and quick. We still don’t know where the S209 diesel boats are! The start of week five. There are an awful lot of very nervous people on board, including myself. I slept very badly dreaming of bombs and explosions. I find myself starting at the slightest bang and my head has been pounding at an incredible pace. All the time we seem to be waiting for the next bang—and we are praying it won’t be a torpedo. I am waiting for the sound room to scream ‘torpedo, torpedo, torpedo’ or to say they hold a destroyer at close range. Whilst at (periscope observation) we were harassed by a Neptune aircraft, which forced us deep on occasions. We headed west and at 2000 started edging back towards the datum, the aim now being to have a go at the destroyers—Bouchard and Bueno. 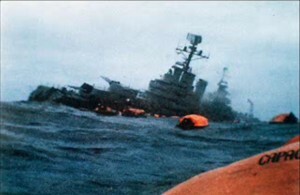 The news today is that the Belgrano is still floating but drifting without steerage. Apparently two of our weapons hit her and exploded; the third ran on, hit the Bouchard but failed to detonate. God, what a catch that would have bee, had we got two in one go! We caught the BBC World Service overnight, in which it was stated that an unknown submarine had attacked Argentines’ second largest warship, outside the exclusion zone; the Argentines apparently denied that damage had been serious (of course they would). However, after the attack yesterday, we heard loud banging noises. . .which sounded like breaking-up. We reached the datum last night, and, after intensive searching, found no sign either of the Belgrano or of the two destroyers. It looks, therefore, as though the cruiser may well have gone down. . .At about 0400 we gained a surface contact. . .At sunrise we came up for a look and discovered she was a hospital ship, supported by one of the destroyers. Shortly afterwards, we received a signal saying that we had sunk the Belgrano. There were 1,000 men aboard, though we weren’t told if there were any survivors, which I think is extremely unlikely. We were not authorised to attack the hospital ship, or the destroyer, as she was assisting the search for survivors. So we opened at high speed to the north. . .
Later in the day we received bad news (of the Argentine Exocet attack on HMS Sheffield). . .We think one of the destroyers may be on its way to finish Sheffield off, so we are head off to intercept and if that is so. There is much talk of ‘when we get back home,’ but we are still very nervous and a bit subdued. Odd that we haven’t had any diplomatic up dates for awhile—perhaps everything has broken down? The first news of the day is not good. Firstly, Sheffield was indeed hit by Exocet. She is reported as a ‘floating hulk’ some 70 km south of the Falklands. The other particularly bad news for us is that we have a steam leak on one of the steam generators. This could be disastrous—suicidal—if attempting evasive manoeuvres after an attack. Christ!—I hope the politicians see sense and it a day. The latest news is that has been confirmed that there are over 800 survivors from the Belgrano, including their CO. So I suppose about 200 must have gone down with her. Does it make one feel any better knowing we killed less than originally thought? Can we believe that things are not so bad as only 200 died instead of 1000? Do the numbers make the deed any less terrible? I think not. On 9 June she was ordered to go inside the Argentine 12-mile territorial limit to take a look at a task group consisting of two destroyers and a tanker; but there were no more engagements. After an uneventful voyage home, Conqueror, flying the ‘Jolly Roger,’ berthed at Faslane submarine base on 3 July. 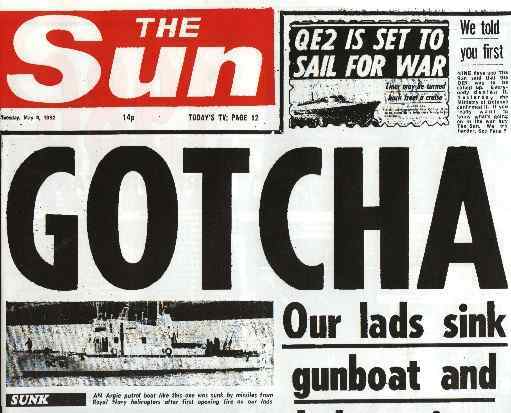 Washington Post, 23.12.84: ‘British defense officials began seeking all copies of the diary after excepts from it initally appeared earlier this year in a book published in london, The Sinking of the Belgrano by Desmond Rice and Arthur T. Gavshon’ … Then, after The Observer published the above, its Editor Donald Trelford was asked by defence ministry officials to hand over the diary last month ‘on the grounds that it contained important security information’. Trelford refused to disclose his source. © 2012 Belgrano Inquiry: Is Maggie Thatcher a War Criminal?